After Rich died in 2013, Liz proposed using the contributions made in his memory to help build a Healing Garden. 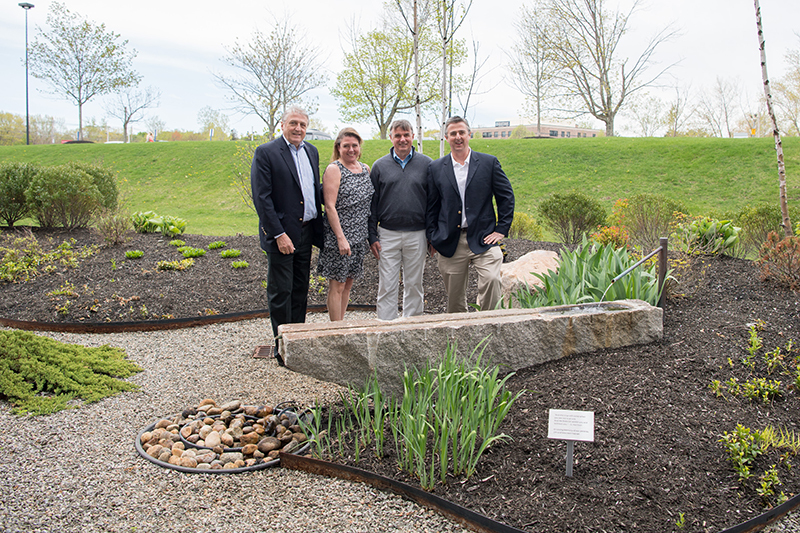 Liz worked with hospital leadership to make the garden a reality, made possible in large part by the J.B. Thomas Lahey Foundation. Today, the Peabody Healing Garden, located outside the Sophia Gordon Cancer Center’s infusion room, provides a much-needed respite for patients, families and staff. “It’s so much more than I envisioned,” Liz said recently, four years after the garden was built. The garden includes a paved sitting area with tables, benches, flowering trees and potted plants outside the Infusion Center waiting room. Outside the Infusion Center is a more private pebbled area, where a duck sometimes waddles around the bushes. A path of plants separates the two parts of the garden. “The nurses say patients always comment on what a lovely view it is, and how nice is it to be able to look outside,” Liz said. She has made a three-year pledge to the garden’s stewardship fund, and continues to be involved in decisions regarding its upkeep. “It’s very important to me,” she said. Other grateful families have also donated to the garden in memory of their loved ones. Maureen Feenan’s children sponsored the addition of a water feature and bench to the garden this year. The pieces honor not only their mother, who received cancer treatment at Lahey Medical Center, Peabody, but also their father, Jim. The family gathered shortly before Mother’s Day this year to rededicate the Healing Garden, and unveil the new bench and water feature. “Both my parents were treated for cancer here,” said Jay Feenan. “I went to almost every single treatment my mother had, and we’d look out the window and just see grass. When we heard another family had proposed a garden, our family wanted to contribute.” In addition to offering a lovely view, the garden provides an outdoor space for families to talk while their loved one is receiving treatment, Jay said. 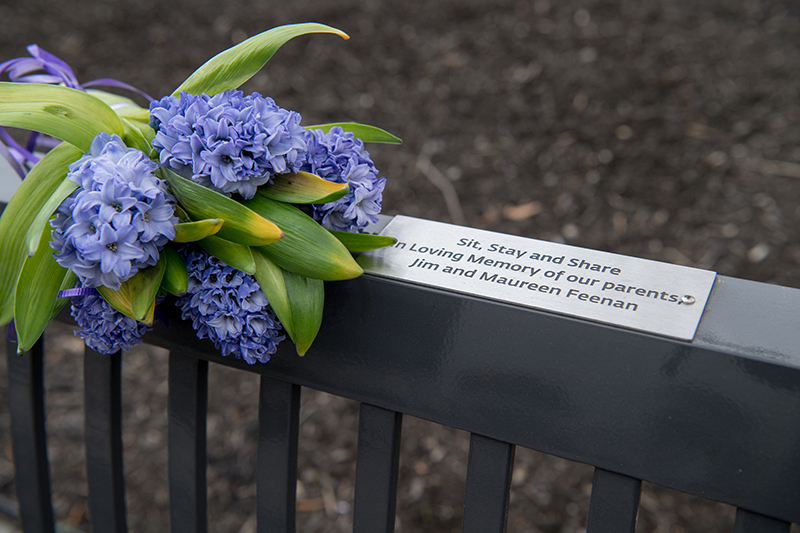 A bench in the garden dedicated to Jim and Maureen Feenan. Donating to the garden is a wonderful way to honor a loved one and keep the garden blooming. Please email Rebecca Kovrlija or call 781.744.3333 for more information. Funds will go to garden upkeep and future projects, such as a pergola to provide shade for those who may not be able to tolerate the sun during their treatment.